Ingredients: SCLEROCARYA BIRREA (MARULA ESSENTIAL OIL), GLYCERINE (PALM), RAW CANE SUGAR, HIMALAYAN SALT CRYSTALS (SODIUM CHLORIDE), CITRUS AURANTIUM (NEROLI ESSENTIAL OIL), CITRUS PARADISI (GRAPEFRUIT ESSENTIAL OIL). 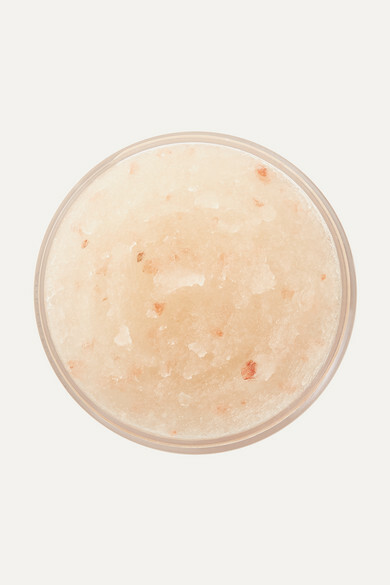 African Botanics' detoxifying scrub is a gentle exfoliant that lifts dead cells and reveals refreshed, smoothed skin. 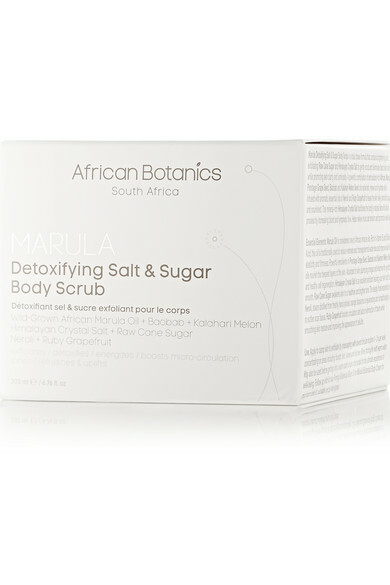 The tiny granules of Raw Cane Sugar and Himalayan Crystal Salt work together with antioxidant-rich Marula, Grape Seed, Baobab and Kalahari Melon Seed Oils to give your body a spa-like treatment. Use it as a prep to whisk away surface impurities before applying daily moisturizers and toners.